Steel wire ropes represent a highly advanced element in modern architecture. 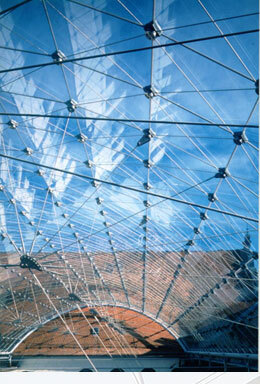 Used as supporting cables for glass facades or glass roofing, as valley cables or tensioning cables in textile membrane structures, we are always impressed by these elements, the transparency and vast extent of spaces. Constructions almost weightless float above the buildings and accentuate urban development. In the private sphere too, cables are used as elements of design, such as climber-systems at building facades, as tensioning cables for canopies or as railings. Copyright © 2019 Augsburger Drahtseilfabrik GmbH. Alle Rechte vorbehalten.